Discover the Malpaís de La Arena Natural Monument. The Malpaís de La Arena Natural Monument is located in the centre of La Oliva, on the island of Fuerteventura. This precious Natural Monument appeared approximately 10.000 years ago in one of the last volcanic eruptions in Fuerteventura. Since the formation of this precious beautiful landscape it hasn’t been change by human hand, due to this fact, in Malpaís de La Arena you might find some of the best tabaibas, tarabillas, aulagas and lichen populations in the canary archipelago. 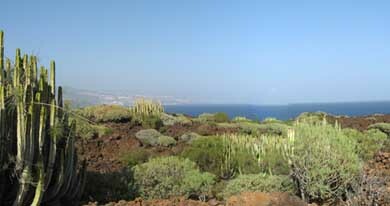 In Malpaís you might also see the Arena Volcano with its 420 meters high, the highest point of this natural monument.